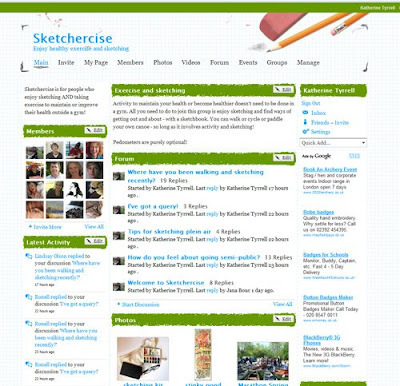 I'd like to introduce you to Sketchercise which is for people who enjoy sketching AND taking exercise to maintain or improve their health outside a gym! Activity to maintain your health or become healthier doesn't need to be done in a gym. All you need to do to join this group is enjoy sketching, have developed the sketching habit and have found ways of getting out and about - with a sketchbook. You can walk or cycle or paddle your own canoe - so long as it involves activity and sketching! Back in 2006/7 I was a member of the blogging crowd who cheered on Julie Oakley (One Mile from Home) as she got out and about, taking a one mile walk each day - with a sketchbook to record what she saw. At the time she was well supported by a small group of like minded sketchers who took their exercise in different ways - such as Alison on her bike in Canberra (Five K Radius) and Penny walking in South Australia (With my boots and sketchbook). I'm sure they kept going because of the mutual support - and that was my main reason for setting up Sketchercise last month. Initially I was looking for a mutual support group - people who would say "Wow - 5 miles!!!" on a periodic basis and keep me going on my own personal quest to lose weight, get fit and reduce the risks to my mobility. Since setting it up it's become very clear to me that there are quite a few people who enjoy combining their sketching activities with some form of exercise - whatever that might be - irrespective of whether the initial motivation is about some form of active intervention around health/weight issues. My reason for walking more is to try and reduce the weight which has absolutely piled on since I snapped my instep - while walking - and my connective tissue disorder was diagnosed. Since then I've had a number of major falls, torn lots of tissue - which means six weeks on crutches every time I have a bad fall - developed feet and ankles which hurt most of the time, increased stiffness, very poor balance and an inability to stand for more than 10 minutes. Increased weight just makes my feet hurt more and increases the likelihood of yet more falls which are in turn very likely to involve yet more tears. What I needed to do was get out of the vicious circle and to create a virtuous circle of diet and activity which would help me to reduce my weight. So - at the beginning of this year I resolved to do something about it. Since 1st January 2009, 'naughty' food, alcohol and all excesses were banned and I started walking. As of the weekly weigh-in last Saturday night I'm now 2lbs short of having lost two stone since New Year's Day. This is despite having another bad fall in February and having to comply with doctors' orders for three weeks leg rest with my leg up all the time in March/April which, as you can imagine, completely stalled the weight loss! What has helped me has been taking my camera and sketchbook out with me on my outings. The idea was to make exercise seem less like something I needed to do and more like something I wanted to do. Now I really enjoy going out for my walks, am finding more and more places to go and see and revisit. I always sketch every time - but every time I see things I could sketch in future! Just over two weeks ago I got a pedometer and in the last two weeks I now know that I've walked more than 40 miles! recording our steps/distances/calories burned and providing support for those dedicated to losing weight! It's a small community at present - just 15 women and 1 man - but we are now thinking about growing it in a controlled way. We're quite keen to keep it on the small side so that we don't feel swamped by people we don't know. On the other hand it needs to get to a certain size to create an active community - and we're leaning towards having an active membership in more ways than one. Each member can invite/sponsor people to join the group and we're also going to let people self-nominate as well - although the process for approving memberships for the latter might take a little time. So - if you already combine sketching with some form of activity and are interested in joining Sketchercise do let us know. Leave a comment below and provide a link to a site which demonstrates what you've been doing so far. and finally...... 8 reasons to exercise! Did you know you burn exactly the same number of calories when you walk a certain distance as when you run the same distance. It just takes a bit longer to get there! I've adapted Jana Bouc's excellent list of reasons for exercise to highlight why it can be such a good idea. Exercise strengthens and stretches muscles which helps to prevent pain and being pain free means being able to draw and paint and do other activities for longer! I hope everything goes well and your health keeps improving! Just de-lurking to say that this is a great idea and I'm going to try it! Thanks for posting. What a great idea Katherine, you always seem to hit the nail on the head with your ideas. I have a constant battle with my weight, and suffer from increasing pain with osteo-arthritis, so know that I should lose weight and take more exercise as well but hate the gym. I also don't get out and about sketching from life enough either, so this sounds the perfect answer. I don't have a website or blog but could join flickr maybe? I did not know that there were "'naughty' food, alcohol and all excesses" in your life :). Thank you for starting the group. I am sure that you will recover and improve your physics with regular sketchercise ! I do it not that much for reducing weight rather than keeping it under control. My main fitness reason is to avoid back pains and to keep mental fitness. It's amazing how much my brain gets a workout when I go walking. I always come back feeling like I've just thrown the 'gubbins' in my mental trash can out! I'm sorry to hear of your foot injury, but glad you're back on track--and then some! I've been packing on the pounds too since developing breathing problems about three years ago; I've been too easy on myself, out of fear, but now my relatively sedentary ways and increasing poundage are concerns of their own. Thanks for the impetus, and inspiration!